Add some color and flavor to your Instagram account by seeking out and snapping some of London's most photogenic snacks. From zany ice cream clouds to weird and wonderful waffles, here are seven of the city's Insta-famous bites. If you're patient and have a sweet tooth, head on down to Milk Train, a hugely popular dessert cafe where the signature soft serve ice creams draw large crowds. This Covent Garden hotspot churns out Taiwanese-inspired ice creams wrapped in fluffy clouds of cotton candy. Choose a base flavor (vanilla, matcha or roasted green tea) and then see it get covered in cotton candy before toppings like Oreo cookies, popcorn and strawberries are added. Warning: the cones are tricky to hold, especially with your camera phone in your other hand. The cafe also serves sundaes and shaved ice. 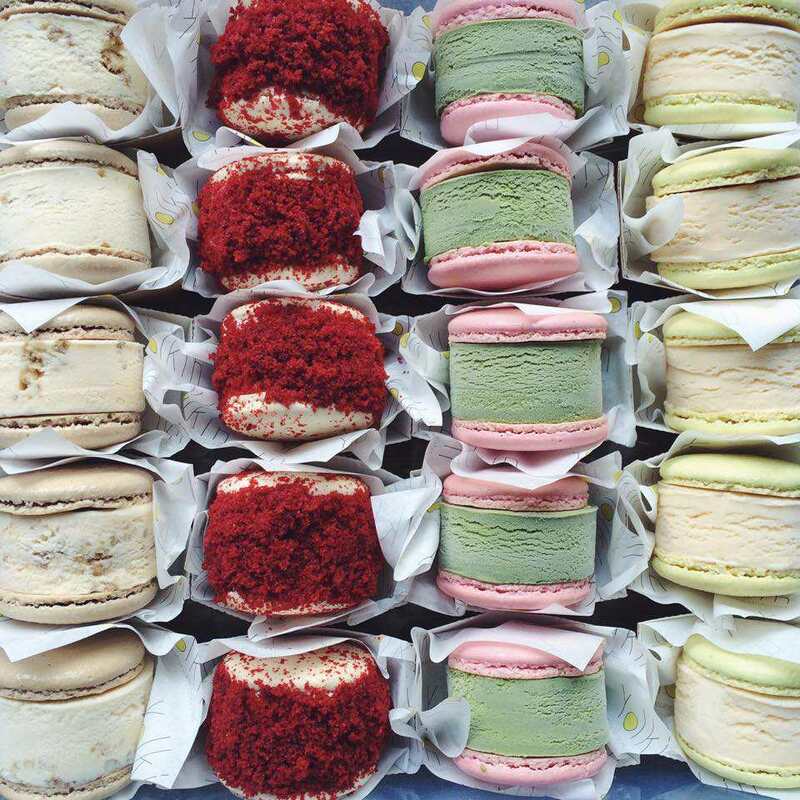 Yolkin brings together two food trends: macarons and ice cream sandwiches. The Covent Garden pop-up store sells a colorful range of unusual flavors including matcha and black sesame alongside macarons inspired by candy bars including Snickers and Skittles. A list of flavors is published every Tuesday and the shop opens only on Saturdays and Sundays until the products sell out (usually around mid afternoon after the doors open at noon). Note that Yolkin operates as a pop-up business and there is currently no fixed address. In the heart of Chinatown, Bubblewrap has taken Instagram by storm. Savvy social media fans queue for hours to get their hands on these giant bubble-shaped egg waffles loaded with gelato and sweet toppings like Oreo crunch, Nutella and salted caramel. The oversize treats originate from China where they're a popular Cantonese street snack. Choose from three waffle flavors (plain, cocoa, matcha) and pair with a Hong Kong-style milk tea. This bubblegum pink shop turns heads in London's Belgravia neighborhood. The entrance is decorated with an impressive arc of flowers and a dusky pink vintage bike and hundreds of people stop for a snap by the doorway every day. Inside the cakes are just as impressive. Pick from a colorful selection of cupcakes, layered sponges and macarons. Grab a pretty strawberry and champagne cupcake for a selfie outside. Get a taste of the tropics with a colorful Hawaiian-inspired Poké bowl at Ahi Poké in Fitzrovia. Loaded with raw fish, fresh vegetables and rice or quinoa, they're as good for your health as they are for your Instagram feed. Get creative and build your own bowl with a base of Ahi tuna, salmon, prawns or marinated mushrooms and a rainbow of veggie toppings and tasty sauces like sweet ponzu, siracha mayo and black chili. The tiny beach shack-style store is decorated with ocean-blue tiles and surfboards. If you want to make your Instagram followers drool, post an image of a juicy burger from Patty & Bun, purveyors of some of London's finest meaty sandwiches. All-day queues are typical at the Patty & Bun outlets across London, an impressive feat for a business that started life as a small pop up burger joint. Order the signature 'Ari Gold' which brings together a British beef patty, cheese, lettuce, tomato, pickled onions, ketchup and homemade smokey mayo in a brioche bun. Pair with a portion of fries dusted with chicken skin salt.